Thinking of installing a garage door or investing in garage door repair? You are investing in more than just a place to house your cars. 1. Weight Room: What better place to store your workout equipment and get your sweat on than your garage? Spacious enough to house everything from hand weights to a Bowflex, and separated from rooms in your home where “quiet” may be the preferred noise level, the garage is a place where you can blast “eye of the tiger” and push your physical endurance (and aerobic dance moves cheese factor) without worrying about knocking over a lamp or getting Gatorade on the carpet. If things get too hot, you can always open the door for a little breeze during your calorie-burning-session. 2. Workshop: If you practice woodworking, welding, or a fine art like painting, your activities take up space and may require materials that are messy, loud, and that shed toxic, or at least strong-smelling, fumes. 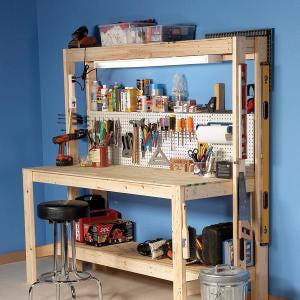 The garage is an ideal place for any of the above, in which you can make the mess necessary to create those cabinets or your next still life masterpiece, all while storing your materials away from little hands and paws. 3. Storage: This wide space is ideal for keeping yard equipment, power tools, and sealed boxes safe from the elements and out of your hair. Most people have boxed-up items, such as old baby clothes or inherited heirlooms, that take up space in closets that could be used for more frequently-needed items. The garage provides a perfect place for possessions that you want to keep, but also want to keep out of the way. 4. Gardening Shed: Looking for a place to house everything from your uncoiled hose to extra pots for plants? Look no further than your garage. With enough space to fit large outdoor tools, from your lawnmower to a tangle of small shovels and bags of soil and fertilizer, your garage can accommodate. Bonus: the garage is one of those places that can get a little dirtier than other areas of your home, so go ahead, spill some potting soil. Your garage is a natural place to house your out-of-the-way items and pursue hobbies that take up space and often make noise or a well-meaning mess. Interested? Give Ponderosa a call for answers to all your garage door installation questions.